The U.S. Department of Defense and Lockheed Martin (LM) have finalized an $11.5 billion contract for the production and delivery of 141 F-35 aircraft at the lowest per aircraft price in program history. In LRIP 11, the F-35B unit cost was lowered to $115.5 million. This represents a 5.7% reduction from the $122.4 million it cost for the short-takeoff and landing variant in LRIP 10. The F-35C unit cost was lowered to $107.7 million. This represents an 11.1% reduction from the $121.2 million it cost for the carrier variant in LRIP 10. 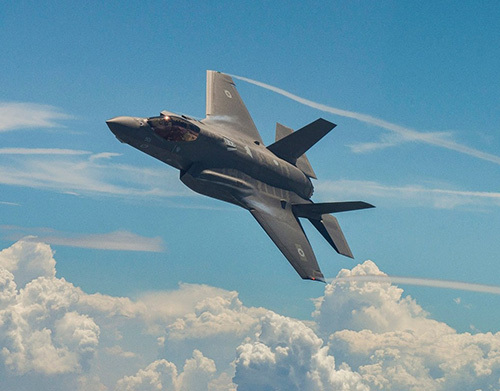 The LRIP 11 agreement funds 91 aircraft for the U.S. Services, 28 for F-35 International Partners and 22 for F-35 Foreign Military Sales customers. Deliveries will begin in 2019. “Driving down cost is critical to the success of this program. We are delivering on our commitment to get the best price for taxpayers and warfighters,” said Vice Admiral Mat Winter, F-35 Program Executive Officer. “This agreement for the next lot of F-35s represents a fair deal for the U.S. Government, our international partnership and industry. We remain focused on aggressively reducing F-35 cost and delivering best value,” he added. “This agreement marks a significant step forward for the F-35 program as we continue to increase production, reduce costs and deliver transformational capabilities to our men and women in uniform,” said Greg Ulmer, F-35 Vice President and General Manager. “As production ramps up, and we implement additional cost savings initiatives, we are on track to reduce the cost of the F-35A to $80 million by 2020, which is equal to or less than legacy aircraft, while providing a major leap in capability,” he added. This year, Lockheed Martin received three Edison Awards for ground-breaking innovations in autonomy, satellite technology and directed energy.